The area of the sanctuary is situated close to the Castalian Spring. The oldest archaeological finds, constituted mainly by terracotta figurines of female deities (displayed in the Museum) reveal that the area was used for the cult of the mother goddess from Mycenaean times. During the Archaic period it was consecrated to the goddess Athena Pronaia (“in front of the temple”), who was entrusted with protecting the territory of her brother Apollo. Herodotus recounts that it was Athena who caused the earthquake that stopped the Persians as they were about to sack Delphi in 480 BC. As in the sanctuary of Apollo, the sacred area – situated on a terrace – was surrounded by a peribolos with several entrances and comprised many structures. In the centre of the terrace, to the west of the treasuries, three columns of the Tholos have been re-erected on their original site. 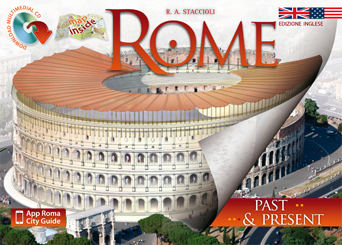 This building was one of the architectural masterpieces of the fourth century BC, constructed by Theodorus of Phocaea around 370 BC, although its purpose is unknown. The Tholos is a relatively rare temple type, for it is a circular building (with a diameter of 13.5 metres) built from white Pentelic marble on a dark Eleusis stone base, creating a strong colour contrast. The outer peribolos consisted of 20 Doric columns, while the cella featured 10 Corinthian half-columns on a high dark stone plinth. The ceiling of the portico was coffered, while the roof appeared conical from the outside, covered with stone tiles. There were two friezes on the wall of the cella, one inside and one outside, each comprising forty metopes, which depicted the Amazonomachy and the Centauromachy. 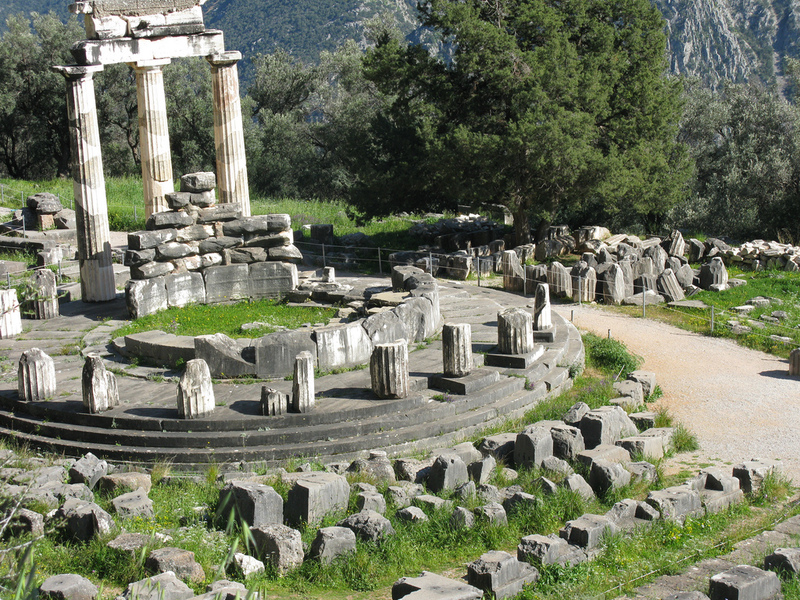 Do you want to know more about Delphi and the history of Greece? 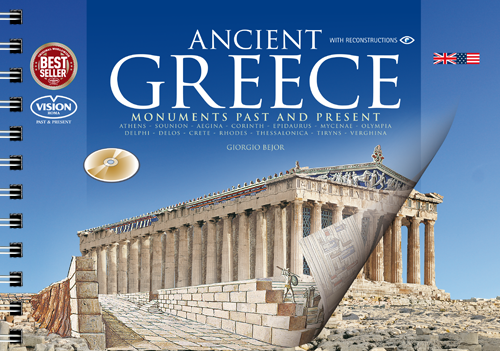 Check out our guidebook to Ancient Greece, with detailed history and Past & Present images of the Acropolis, the Parthenon, Delphi and all the greatest historical and archaeological sites of Ancient Greece.